Netherrealm Studios has released Injustice 2 Mobile version 2.1 for Android and iOS devices. 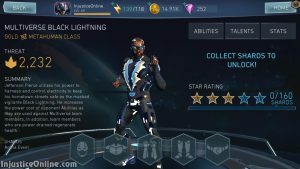 This release brings an expansion of the Leagues mode with missions, several changes to the Arena mode, a much anticipated new hero in the face of Multiverse Black Lightning and more. With the release of this version Netherrealm Studios also announced that there will be a delay in the shard exchange system due to a discovered bug. Lets take a look at all the changes in this version. Pip Refresh Timer Increased: Arena hero pips now refresh every 24 hours instead of every 12 hours. Paid Refreshes Number Lowered: The amount of refreshes players may purchase has been reduced to a maximum of 2 every 24 hours. The previous amount was 10. Note that Arena rewards are NOT changing in any way. Since these changes affect everyone equally, they will reduce the grind for players in Arena while allowing more opportunities for players to better enjoy other game modes such as Leagues, Campaign and Challenge. In addition, to celebrate the digital release of the Justice League movie, Justice League arena seasons will see the return of Cyborg Invasions granting more Justice League heroes shards. 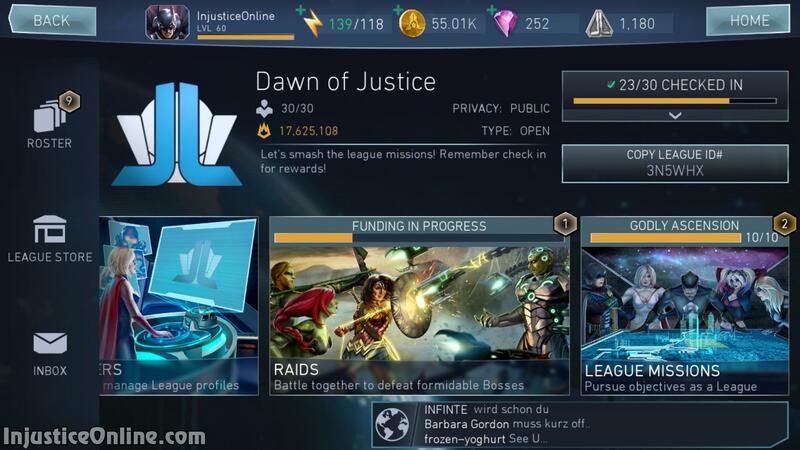 League Missions – A new way to earn rewards! Complete the objectives as a team and everyone in your League will earn rewards. Some objectives include winning a number of arena battles, winning a number of heroic campaign battles, gaining a number of levels on characters, etc. 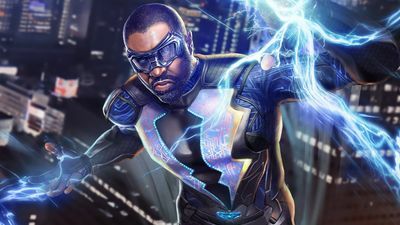 Inspired by the new CW TV series, Black Lightning joins the roster as the new Multiverse Arena character. Battle your way to the top with his electric moves and earth shaking attacks. Black Lightning’s opponents will struggle to keep their power when they are up against this Metahuman! Available as an Arena hero and special offer. Team members who are power drained, regenerate health for each bar of power drained. Grants a benefit (health) to what normally is only a negative effect (power drain). Power cost of opponent Abilities increases per use against Multiverse team members (does not stack with similar passive Abilities). As a battle progresses, your opponents Abilities will increase in power cost and therefore decrease in frequency & potential damage. In addition to Damage-Over-Time, this hazard will temporarily disable the opponent’s Basic attacks and movement. 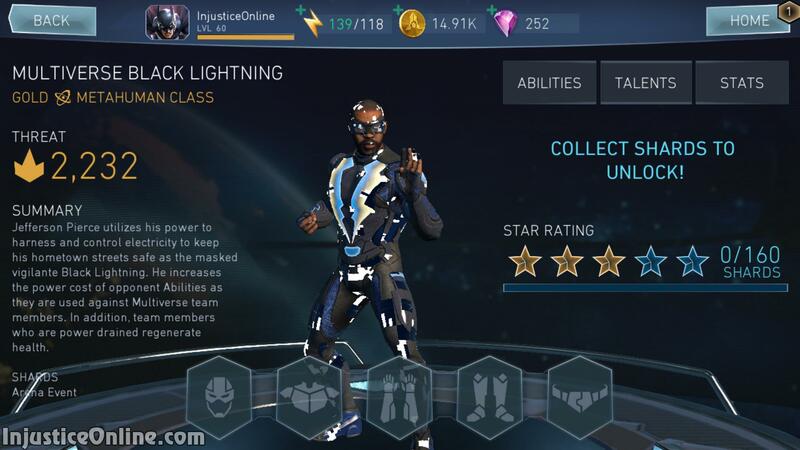 Victim may only Block or perform Abilities (which would increase in Power Cost due to Black Lightning’s passive). High damage attack with a lightning strike that Armor Pierces. His Rush Attack (Swipe Right) hits twice. When performing either Ability 1 or 3 (“Wave of Thunder”/“Pierce of Lightning”), he’ll teleport close to the opponent before attacking. We will release the new hero the week of Valentine’s Day and will provide more details soon. When we send Arena rewards at the end of the season we now include the tier that players ended up at. This is to avoid confusion when receiving rewards. We’ve fixed Powered Super Girl – There was an unintended bug introduced where her passive required that you had enough power to use her SP1. She’s back to normal and will grant you free use of her SP1 when she does critical damage. 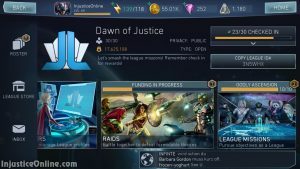 What do you think about the Injustice 2 Mobile Justice League update? Tell us in the comments sections below.